Raspberry Pi users that need to connect a number of USB devices to their mini PC system might be interested in the new Raspiado USB hub which has been specifically designed to fit perfectly on top of a Raspberry Pi single board computer. 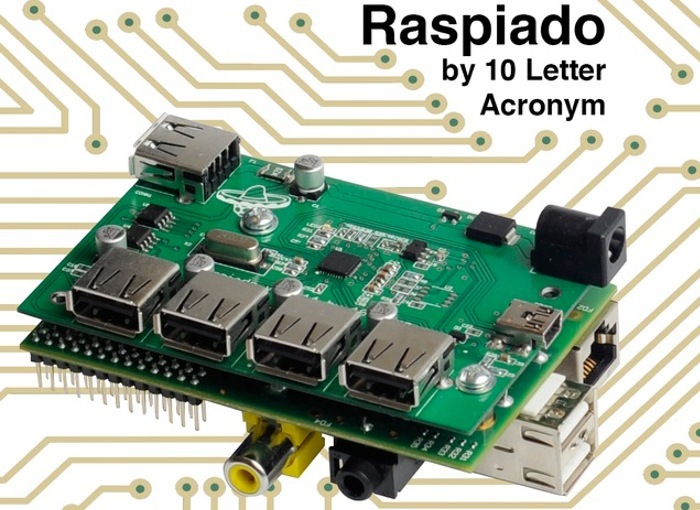 The Raspiado has been created to solve three problems its inventor encounters when using the Raspberry Pi computer. Including the lack of USB ports, the power required to run USB attached peripherals and also the problem of having USB hubs alongside the Raspberry Pi as a separate device. The Raspiado Raspberry Pi USB Hub project is currently over on the Kickstarter crowd funding website looking to raise enough pledges to make the jump from concept to production. Chris Kaschner is responsible for creating the Raspiado USP hub and explains a little more about the issues he and many other Raspberry Pi users have encountered whilst using the $35 mini PC. “My projects have usually required at least 3 separate USB attached peripherals (keyboard, mouse, and wifi adapter) and the Raspberry Pi only has 2 USB ports available. If you have more than 2 USB items you want to attach, especially if those things draw very much current, then you need a USB hub. Fitting a USB hub alongside my Raspberry Pi produces a rat’s nest of cables, not to mention a weird situation where multiple USB cables were traveling from a USB hub into the RPi (to power it) and downstream out of the RPi to the hub to provide the necessary number of USB ports. So if you think the Raspiado USB hub is something you could benefit from, visit the Kickstarter website now to make a pledge and help Raspiado become a reality.